Our Summer Evening Fishing at Grafham will start on Tuesday May 14th and then every Tuesday, finishing on August 13th. Anglian Water once again have agreed to give a free evening’s fishing to those who have done a course with Peter Hartley. The Tuesday Evening League will run again, but participation is not obligatory. Scoring will be on numbers caught, no weigh in, best 10 results to count. Start time is 5.30pm, but there will be someone around until 6pm to organise boat pairings etc. for those who cannot make it by 5.30pm. A call from anyone arriving after 5.30pm would be appreciated. Peter Brewer and Paul Heavens will, as last year, be assisting with the running of the event. Draw for boat partners will take place at approx 5.15pm and where possible less experienced fishermen will be teamed up with experienced anglers. An Anglian Water Season Ticket or day ticket will be required, also an Environment Agency Rod Licence. Evening boat cost is £7.50 per person. A 1 fish plus C&R ticket is available at £12.00. These show a £1.00 increase from last year. The Lodge Shop will be open until 5.30 pm. Anglian Water have kindly agreed to provide a free boat ticket on any evening that 10 or more anglers are fishing. We will draw for this in the pub after fishing. We go to the Wheatsheaf in Perry after fishing for a drink and sandwiches and chips. Please pay for sandwiches when you book in with the Shop on arrival. Cost of sandwiches is unchanged at £5.00. The aim of the series is to have some pleasant summer evenings fishing at Grafham (weather permitting! ), rather than a serious competitive event, also to give those who have done a fly fishing course the opportunity to gain some experience. We all had to start somewhere. Further information from Paul Stevens. We start our season with the Norman Shippey Memorial bank fishing day at Elinor Trout Fishery. This informal and very social day is always popular and the fishing is normally exceptional with some large fish often being caught. Fishing is from around 9:30am until around 3:30pm depending on the weather. There is no ‘weigh-in’ and the winner is decided on number of fish caught. No need to retain fish unless you want them, you can catch and release and keep a mental note of how many you catch. Please let Mark Searle know if you would like to fish. It is with great pleasure that Invicta FFC can now confirm the details of the Inter-Club Floating Line Competition 2019. The competition is to be held at Grafham Water on Saturday 4th May 2019, again sponsored by Snowbee® and organised by Invicta FFC. It would be good to see several Invicta teams enter so why not get a team together and get that entry form sent off. Its a great day. All team entries to Gary How. If you would like to fish in this event but are not in a four man team, please send your name to Paul Stevens and he will put you in a team. Cost £65.00. Please send a cheque to him or pay by transfer into our Club Account. Sort Code. 20-43-63. Account No. 70514004. The annual Pilgrimage against our friends from the Leslie (Wales) and Llanilar (Scotland) Clubs this year will be on the Thursday the 23rd and Friday the 24th May at Grafham. We have been meeting once a year for so long that we can be called ‘old boys’ without any offence. The event will be the usual laid back agenda with a practice day on the Thursday and the friendly match on the Friday. We have booked dinner on the Thursday evening at the Wheatsheaf in Perry, where the food is always excellent, and dinner on Friday evening will be at Grafham Lodge. All in it will be an enjoyable couple of days and anyone is welcome to fish. So if you would like a couple of days of very enjoyable and friendly fishing with the characters from Wales and Scotland you should join us. If you would like to attend or would like more details could you please contact by either email jan_steve@sky.com or on my mobile, 07826271153. Chris McLeod and Keith Jones are organising this Bank Match at Grafham, with breakfast and post match meal. Fishing will be from 9:30am to 3pm with a six fish limit (no Browns). Special dispensation by Anglian Water so Bronze ticket holders can take 6 fish. We end our season in the traditional manner with the Fur and Feather bank fishing day at Elinor Trout Fishery. This event is always popular and the fishing is normally very good with some big fish often being caught. We ask those taking part to bring along a prize and we then have a draw and everyone goes home with something. The Hinckley Shield is a bank fishing match for teams of 6 anglers. Invicta won this match last year and so are organising it this year. We have one team (the winning one from last year, and those anglers have already contacted me). Invicta’s Northern Representative Peter Oldham catching grayling on the Dee. 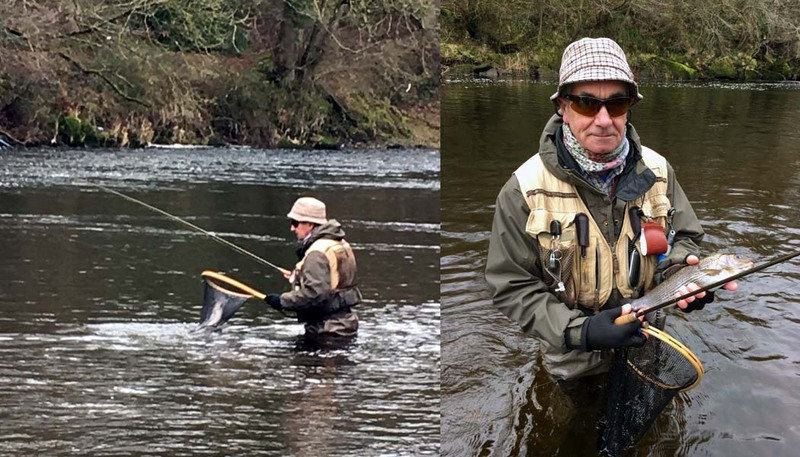 Our Northern Representative Peter Oldham has offered to arrange a grayling fishing day on the Dee. The trip would be on Monday 12th November. The cost of the fishing would be £18 per day via the website or in the town so little risk of wastage as can be purchased on the day or day before. If members wished to stay over and fish on the next day, Peter would also be able to arrange overnight accommodation for the Monday night (price to be confirmed but in the region of £70) Hotel will depend on whatever deal he can get, which will depend on numbers; risk factor in case of cancellation will depend on any deposit needed, possibly full if short notice or payable in advance. Wading on the Dee is very variable – some good long gravel stretches, also some faster runs with boulders. For anyone, a wading staff is strongly suggested, and some advice is to wear a life vest. The wading obviously depends on the water level, which can be read hourly on EA site. Yes trotting on the Dee is fine. Peter has said that if it helps for those attending he will do a short advisory note about tackle, techniques etc (although he doesn’t want to be seen as a guide or tutor, but will help as much as possible). Please let Paul Heavens know if you are interested in this trip by the 7th October. The numbers are restricted to 6 anglers so it must be on a first come basis.